My health has been playing up this past week and things have been slow both on the blog and otherwise. But I prefer to stay positive. So, in todays post I am going to show you guys some beautiful photos from my recent Dartmoor visit and my lovely Barbour wellies from E-outdoor. This was our first visit to Dartmoor and we fell in love with the place. The landscape in Dartmoor National Park was dramatic - from the stunning granite tors to large expanses of heather covered moorland to wooded valleys - everything was beautiful. The area is a fusion of opposites - on one hand you will find people coming here for physically active pursuits (rock climbing, horse riding, camping, canoeing etc.) and on the other some visit to experience and enjoy the tranquillity the place offers. Our visit was a combination of both and we loved it. Beautiful place, isn't it? Now moving onto my Barbour wellies. My footwear size is 5 and I ordered the wellies in the same size. These are slightly big at the calves but a good, thick pair of socks sorts the issue making them a comfortable fit. The wellies have rubber outer and sole with the signature Barbour tartan lining giving it an elegant finish and comfortable feel. Because of my petite frame, I prefer mid-cut footwear and these wellies are perfect in that aspect. I have been using them for over a month having carried them on our Dartmoor trip, as well as for local long walks and they have performed well. They are comfortable and feel durable. I like the design of the wellies - easy to walk in and light enough to wear for long walks. These are perfect for me. While I opted for Navy, these wellies come in other colours as well - Eggshell blue, Olive, Yellow and Red. The wellies are easy maintenance. Just ensure that you wipe off the dirt/mud with a damp cloth after every use and the wellies look as good as new. - Allows for flexibility while walking. - Good grip (I have not slipped even on very muddy ground). Overall, I love these Barbour wellies. They look good, are comfortable and do their job. So, I no longer have to worry about getting mud, dirt or water on my clothing. And before I sign off, there is one more wonderful item I need to tell you about - the Extremities Unisex Silk Liner Glove. Some of my readers will know that I have RA - it has affected my hands. Exposure to cold winds aggravates the symptoms in my finger joints, so I need to keep them covered when outdoors. But I hate thick gloves. I find them a hindrance. So, many times I forget or resist wearing gloves and then I pay for it with inflamed joints. 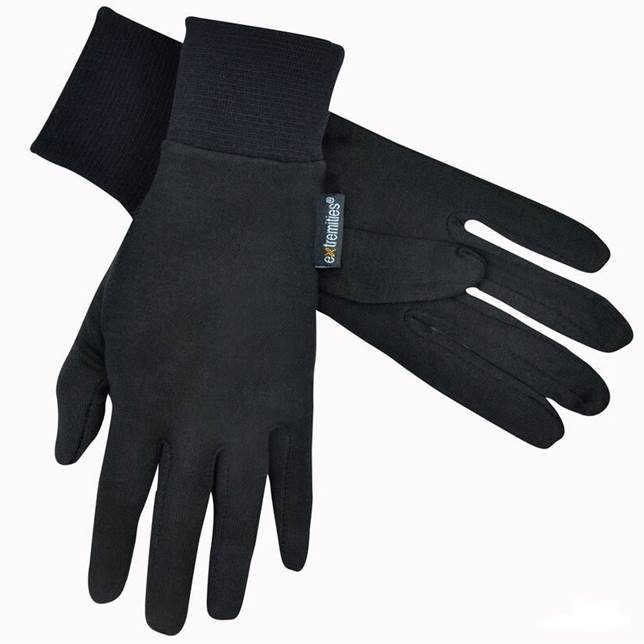 The Extremities Unisex Silk Liner Glove is a liner glove to be worn under your regular gloves. But let me tell you these are fabulous on their own as well, especially when the weather is mildly cold. They are very good at keeping my hands warm. They are made from 100% Silk and are very lightweight and comfortable. You don't feel like you are wearing a glove. But they work very well. And when the weather gets too cold, you can wear these under other gloves! Excellent. I had not expected this glove to work as effectively as it does. If you are looking for a lightweight glove, then this one is recommended. You can purchase both these items from the E-Outdoor website. The website offers all kinds of camping equipment, outdoor clothing and footwear with fast mainland UK delivery. Yes, Dartmoor was beautiful. It was our first visit but definitely not the last.